The aircraft of Biman Bangladesh Airlines, which was reportedly attempted to hijack by a passenger, will resume its operation by flying for Sylhet on Thursday morning. The spokesman of the national carrier Shakil Meraj told media that the flight no BG-601 of Boeing 737-800 ‘Mayurpankhi’ will fly for Sylhet from Dhaka airport at 10:45am. 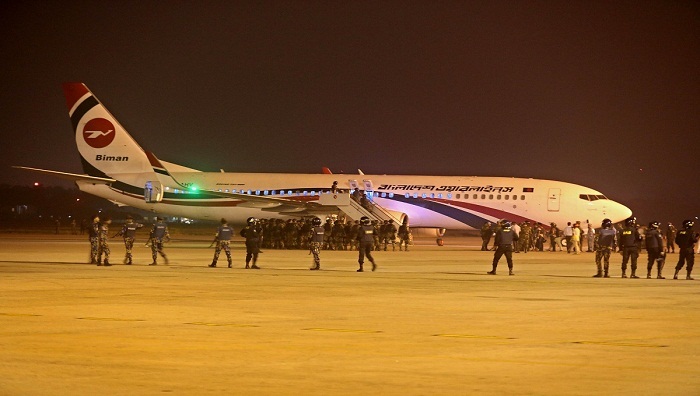 Earlier on February 24, a joint team of the para-commando wing of Bangladesh Army, Bangladesh Air Force, and Rapid Action Battalion killed a passenger who allegedly tried to hijack the Dubai-bound ‘Mayurpankhi’ mid-air on way from Dhaka to Shah Amanat International Airport in Chattogram. All 142 passengers and crewmembers were evacuated safely from the aircraft before a commando operation was conducted on it.